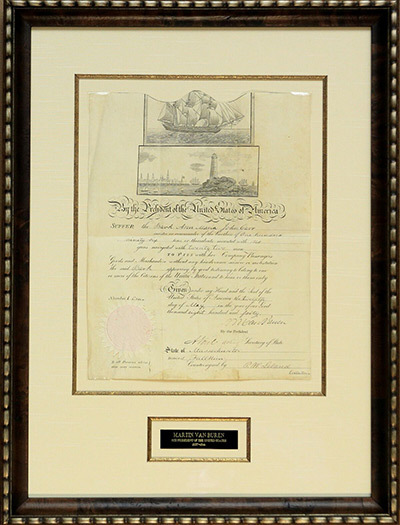 This passport was issued in Fall River, Massachusetts, to the barque Ann-Maria, which was under the command of John Carr and had a carrying capacity of 196 tons (known as “burthen” or “burden”). There is no information on destination or cargo, but the Ann-Maria carried no guns and had a crew of 22 men. This Mediterranean passport is signed by President Martin Van Buren who served one term from March 4,1837 until March 4, 1841. He had been the most loyal of members of Andrew Jackson fractious cabinet and became Vice-President after the resignation of John C. Calhoun. He came into office during a wave of prosperity, but in months the Panic of 1837 ushered in the worst depression the country had seen. His entire Presidency was devoted to the struggle to retain the solvency of the Federal government. The document is rare since it is curiously signed by Aaron Vail as “Acting Secretary of State.” It is unknown why he had that authority since it was during the term of John Forsyth as Secretary of State and there is no record of Forsyth’s absence or disability. Vail began as a clerk in the Department of State, for a period was acting chargė d’affaires of the U.S. mission in Britain and later chargė d’affaires in Spain until the arrival of Washington Irving, the Minister to Spain. This document is printed on vellum and as is typical of Mediterranean passports, the top is scalloped where the top portion was cut off and sent to United States consuls in the Mediterranean for later matching with the passport held by the ship. It bears the Great Seal of the United States on the lower left.